With Provost Anthony C. Masi’s second term coming to an end in June 2015, the search has begun for his successor. McGill’s Board of Governors this week approved the choice of Board members to serve on the committee that will advise Principal Suzanne Fortier on a suitable candidate. The Board itself will appoint the next Provost, based on the Principal’s recommendation. 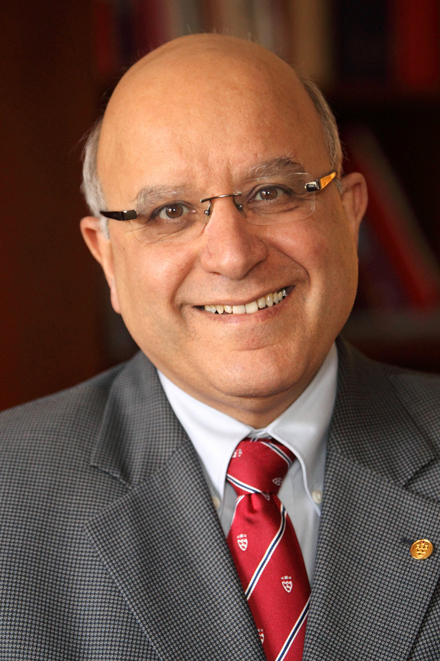 Anthony C. Masi has been McGill’s Provost since 2005. With Provost Anthony C. Masi’s second term coming to an end in June 2015, the search has begun for his successor. McGill’s Board of Governors this week approved the choice of Board members to serve on the committee that will advise Principal Suzanne Fortier on a suitable candidate. The Board itself will appoint the next Provost, based on the Principal’s recommendation. The Provost, who reports to the Principal, is the University’s chief academic officer (after the Principal) and chief budget officer. Masi oversees the strategies, planning, development, implementation and assessment of all academic programs and the development of the overall budget to align with McGill’s academic priorities. This Provostial model was adopted at McGill in 2007 with the view that academic planning, budget planning and approval are integrated and work to support the achievement of the University’s academic mission. Masi was named Interim Provost in March 2005, an appointment that was made permanent in December of that year. His appointment for a second five-year term was renewed in 2010. He has also served as a professor in the Department of Sociology and has been the University’s Chief Information Officer. Prof. Fortier will chair the Advisory Committee, which will hold consultations on campus with various groups, including two pubic meetings, as it deliberates on attributes and qualifications the new Provost should possess. Details of those meetings are below. From Senate: Davide Eidelman, Dean of Medicine and Vice-Principal of Health Affairs; Susanne Lajoie, Professor and Canada Research Chair in the Department of Educational and Counselling Psychology; Bruce Lennox, Professor, Department of Chemistry; and Geneviève Saumier, Associate Professor in the Faculty of Law. From the Board of Governors: Lili de Grandpré (Governor Emerita); Claude Généreux (Vice-Chair); Samuel Minzberg (Chair, Nominating, Governance and Ethics Committee); and H. Arnold Steinberg (Chancellor and Governor Emeritus). From the Post-Graduate Students’ Society: Elizabeth Cawley, a doctoral student in Psychiatry. From the Students’ Society of McGill University: Claire Stewart-Kanigan, Vice-President (University Affairs 2014-15). The Committee’s main task will be to identify and assess qualified people for the position, and to advise Prof. Fortier on a candidate to be recommended for appointment. McGill will use a major firm with experience in senior university administration searches. The goal is to complete the work in time to allow the new Provost to take over in the summer of 2015. The Committee wants to consult broadly with the McGill community to identify the qualifications and attributes the next Provost should have, based on an understanding of the key issues of concern to McGill in the years to come. A series of face-to-face meetings to hear views of interested members of the community will be set up before the development a position profile and the start of the search for candidates. Public meetings will be held downtown on Thursday, May 8, at 11 a.m., and Friday, May 23, at 11 a.m., in Room 13 of the McConnell Engineering Building, and at Macdonald Campus on May 26, at 10:30, in the Faculty Lounge of the Macdonald-Stewart Building, where interested members of the community – faculty, staff and students – can meet with the Advisory Committee to discuss the matter. • Do the existing summary of the “Role and Responsibilities of the Provost” and Position Profile adequately describe the position of Provost for the coming five to 10 years? If not, what changes should be considered? • What opportunities, challenges, issues and priorities face the University and the Provost over the next five to 10 years which are relevant to the advisory process? • What are the required and desirable characteristics, leadership skills, qualifications and experience of candidates for the position of Provost? The Committee’s schedule of consultations is available on the website as well. Follow the links for more information on the meetings on May 8, May 23 and at Macdonald Campus on May 26, or in French for May 8, May 23 and at Macdonald Campus on May 26. Members of the McGill community are also invited to submit in writing any input and advice concerning the above questions, and the advisory process in general. Correspondence should be addressed to the Principal, in confidence, by campus mail, care of the Secretary General, or by email to advisory.principal@mcgill.ca. The Committee would like to receive written submissions as soon as possible, and no later than Friday, May 30. In other senior Administration news, Peter Todd, Dean of the Desautels Faculty of Management, has begun his administrative leave after serving for nine years as Dean, and Prof. Morty Yalovsky has been named Interim Dean while the search continues for Todd’s replacement. And an announcement concerning a new Dean of Education (replacing Hélène Perrault, who left McGill last year to take a position with the University of Ottawa) is expected shortly.